It's been a super busy week with work, school and other activities. Aaron is busy prepping for several scripts they are learning at Dallas Young Actors Studio. He's excited to be in the TV Pilot this summer. www.dallasyas.com is an awesome opportunity for any aspiring actor to get the professional training needed for their break into Hollywood. So many young actors have been successfully signed from the Dallas YAS school, it's unreal! You can check out the website above to read all about those success stories. But it's not all luck! There's hard work and training involved in becoming a professional TV/film actor. Think SNL on a local level. At Dallas YAS, students get that professional training from someone who is actually in the business of ..well...showbiz! My son Aaron is an aspiring actor. He has always wanted to act. As a child, he was constantly telling me he wanted to get his "face out there" and that "he was running out of time". He was 4 years old. I did not know where to take him to get his face out there as he requested. One day we googled kids acting schools dallas. Several websites came up but one in particular caught my eye. It was a story on a local TV channel about Dallas acting schools. The acting school is Dallas Young Actors Studio. This school is run by Linda Seto who has extensive experience in TV and production. Several kids have been discovered at her school and are actively working in Hollywood. If you want to learn more about the school you can go here. We have to admit we still have a lot of learning to do! Myself, learning all about showbiz and how things work in the world of Hollywood and Aaron how to perfect his craft. I support him in his dream and hope to one day manage his career at his request. In the meantime, we both enjoy our weekly treks into Dallas and the acting studio. do yourself a favor and contact Dallas Young Actors Studio and set up an audition and tour. Ahh the hot days of summer. All of us are waiting for them aren't we? When the kids are home from school for summer vacay. Wait? No. We need to keep these kids busy! Isn't that what we are all thinking for the summer? I've always been a great believer in supporting our children to explore new things. One of those things can be acting! I haven't been blogging for a while because life! But one thing's for sure, we have been busy. My son Aaron is an actor. He has been training at the prestigious Dallas Young Actors Studio in Dallas. And I tell you the growth he has experienced is tremendous. This is no regular acting school. It's real world training in a real studio with a sound stage and real professionals. This is NOT theater. If you want your child to train to be a real actor for TV and/or film THIS is the place to be. Dallas Young Actors Studio offers coaching and training to be a professional actor. And their summer camps are amazing! Aspiring actors get to train for one entire week just like they would if they were on a real sitcom-because they are! Students get to learn script reading, improvisation, direction and so much more! All in Dallas! It's a week of intense training that is sure to change their lives. At the end of the week, actors will star in an original made for TV sitcom that is taped before a studio audience that the parents are invited to see. The taping will then be provided to you and your actor via a link that you can download and share with friends, family and best of all add to their resume. Contact Dallas Young Actors Studio today to sign up for summer camps because they fill out fast! Kids travel to Dallas from all over the country to attend these one-of-a kind camps. Feel free to ask me questions in the comments below! some ideas for Holiday prep. It's been a whirlwind the last few months, especially with work and my photography business. While I was cleaning out some things from my garage, I noticed I had some very pretty white tablecloths that had yellowed over time. I wanted to use them to set my holiday table. I almost threw them out until I remembered I could use BIZ to whiten them. I brought them inside and filled my washing machine with hot water. I poured in about half a cup of BIZ Stainfighter and threw in the table cloths. I let them soak for about 30 minutes then ran them through a regular cycle. They came out so white and clean! I'm so happy I remembered I had BIZ and didn't throw them out. 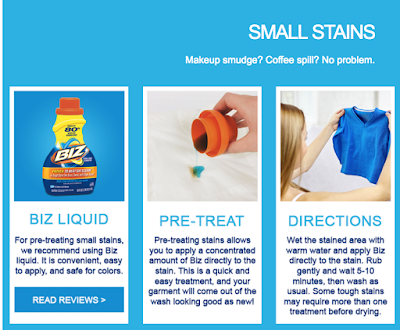 BIZ is the stain fighting, whitening solution for all your laundry needs. There are so many uses for this wonderful product. 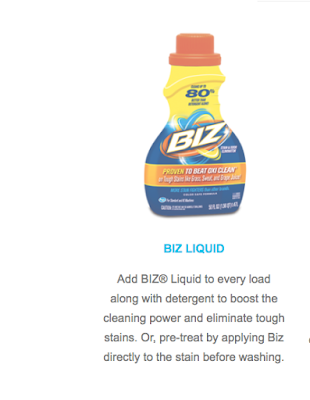 BIZ has special ingredients that other detergents don't. 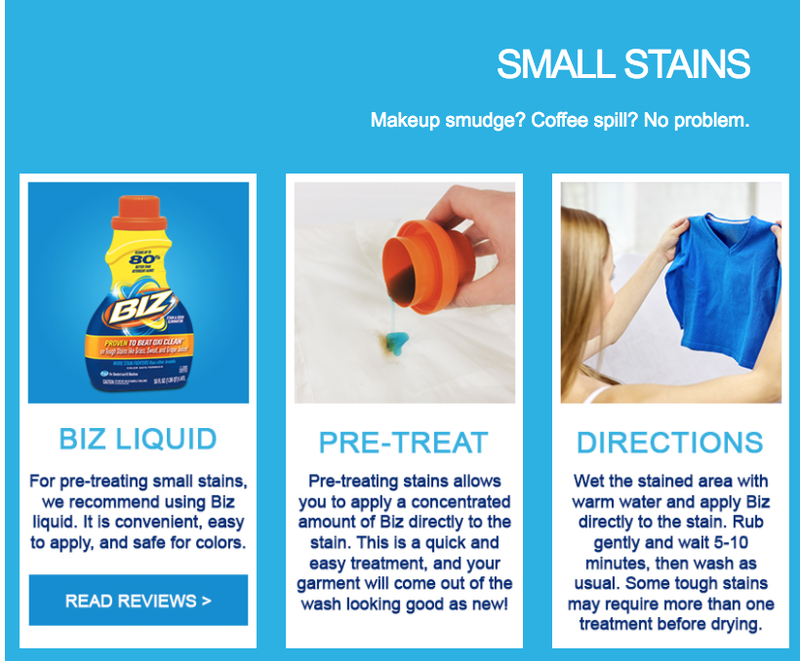 Its ingredients help to fight more stains than other leading brands. I will be back to share some more Holiday ideas with you soon! I was given product to use in exchange for my honest review. All opinions are my own. As you may already know, I am a photographer on my off days. I do a lot of family photography and this often involves small children, which many times requires me to kneel down on gravel, grass, etc. 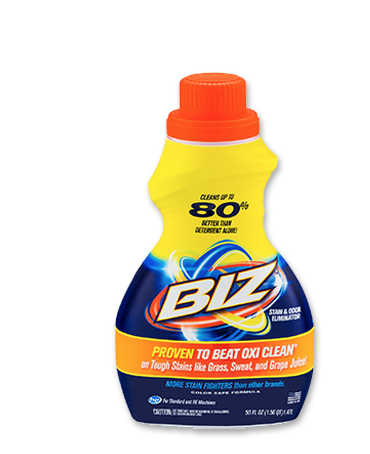 To get those tough stains out, I just put a little bit of Biz stain fighter on the grass stain, rub it in a bit, and let it soak for about 5-10 minutes. I then run it through the wash with Biz as the detergent and voila! The stain is gone! I recently had to do this with a favorite t shirt I splattered with spaghetti sauce. AGH! I hadn't realized it until I got home and I thought for sure the shirt was ruined. Nope, I did the same thing, dab, rub, sit and wash it as usual. T shirt is as good as new. Now you know that those greasy stains are harder to get out. With Biz stain fighter detergent it's as easy as 1-2-3. I highly recommend this detergent. My mother has been using Biz ever since the 70s when I was a kid. She swears by it and now I do too. 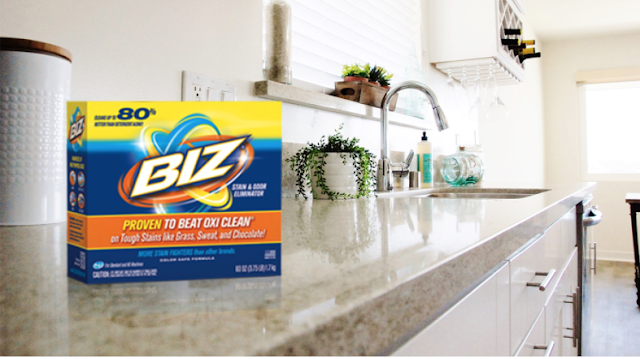 Biz can also be used to tackle other cleaning problems around your home. It's great to clean your tub, tile and other hard surfaces, leaving them sparkling clean. To learn more about all the other uses for BIZ Stain Fighter, go here. You can also get out tough stains from carpet! Watch this video to learn how. I love sharing these laundry tips with you. I'll be back to share some cute Halloween projects I've been working on. I was provided free product and/or compensation for my voluntary testimonial of this product. 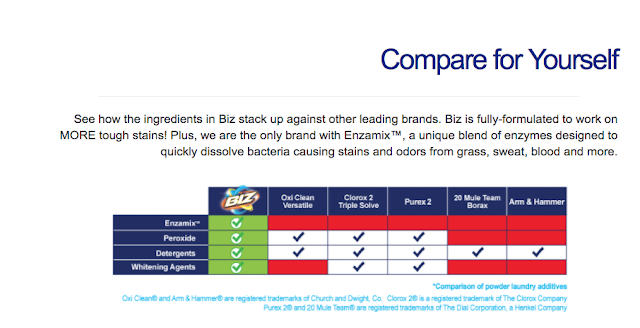 These are actual results and my opinions of the product are purely my own and based on my experience.